A ready to use antibacterial cleaner with pure orange oil. Removes the majority of stains from a multitude of surfaces, terrazzo and stainless steel to carpets and upholstery(always check colour fastness). Spray directly onto the surface and wipe away with a damp cloth. On stubborn marks leave for 30 seconds before wiping away. No need to rinse. A pale green coloured liquid with a pleasant orange fragrance, with the added benefit of antibacterial action. 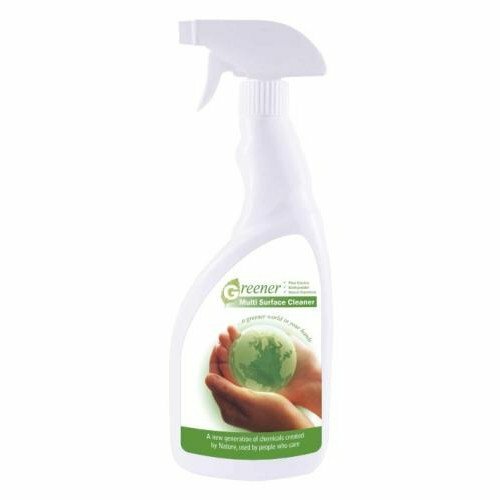 Varied range of cleaners to cover several areas with a new generation of chemicals created by nature and used by people who care with no compromise on quality or efficiency. 1 x 750ml plastic bottles with spray heads packaged in a strong cardboard outer case.